Characters with Japanese Seiyuus. Seiyuu means "voice actor." I Любовь this picture so much!. 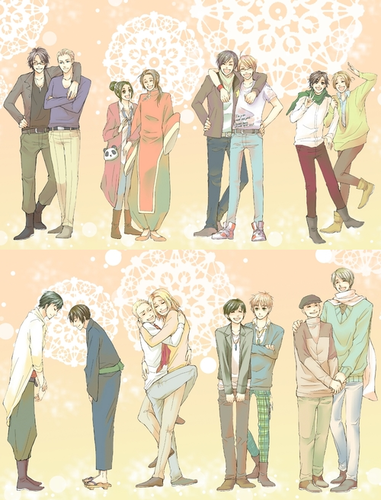 Wallpaper and background images in the Хеталия club tagged: hetalia aph italy france japan america england china russia germany. Seiyuu means "voice actor." I Любовь this picture so much! My favorite one is Masaya Onosaka. Just look at them. 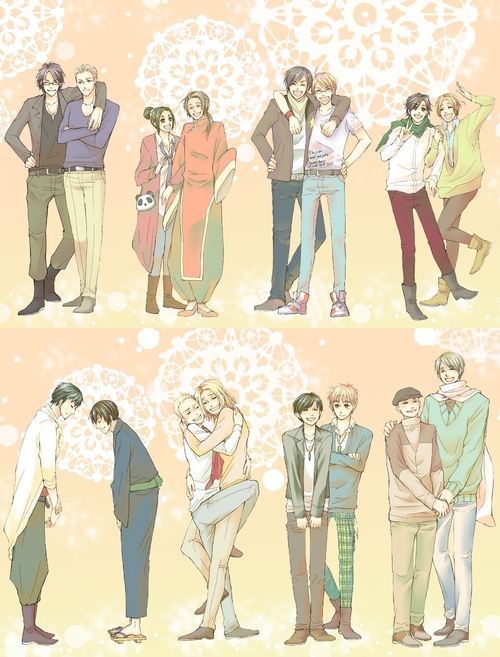 Like character, like seiyuu XDD... He's quite an entertainer. All of them are actually quite funny and amazing in their own way. The seiyuu event vids should summarize it all. As in you'll get total laughter. I LOVE this <3 This is really cool~ <3 I really like both the Japanese and English voice actors~ I wonder if someone will ever draw one with their English voice actors? I love Onosaka-san. XDD He cracks me up. He actually even acts like France and if he grew his hair out he'd look like him. Did you know In 2010 he won the "Best Personality" Seiyu Award? He's a good voice actor, I love a lot of the roles he's done. Since everyone seems to be saying their favourite Seiyuu, my Favourite would have to America and Canada's Seiyuu Konishi Katsuyuki. He has been in many of my favourite animes. I think that the only other Seiyuu i am aware of is England's(can't remember his name) As he voiced William in Kuroshitsuji. Everyone else i have never heard them in any other animes. His name is Noriaki Sugiyama, he also plays Sasuke in Naruto. Uh....how do you know you don't like it, if you've never watched it? And Sugiyama you say... don't forget Uryu. He also dubbed Uryu from Bleach. To think that Bleach and Naruto are supposed to be rivals. He really gets to have the big roles. Well, he's quite a serious guy just like the characters he voices, the straight guy actually. 1. Who the heck cares if it's mainstream. Most of those are really good, they are populer for a reason. Actually, that sounds very hyopcritical, since Hetalia is one of those anime. 2. Fandom really has NOTHING to do with a series. Might as well crawl in a hole and hate everything, because every fandom has idiot fans. 3. You can't say that until you, hmmm, WATCH it. I hate blood and naked anime scenes, but Elfen Lied rocks. 4. So don't be so biased. 5. All the episodes in Naruto are important, they add and build up the plot. It's called a story.